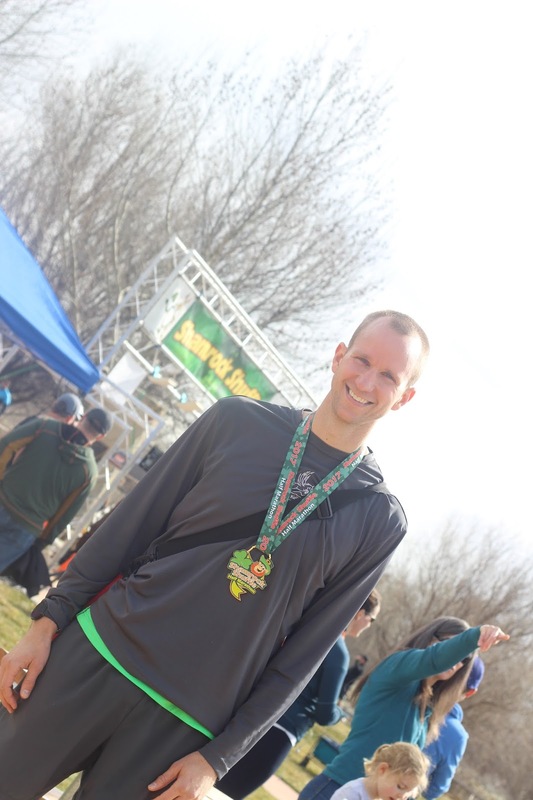 On Saturday I ran the Shamrock Shuffle Half Marathon. The course made for a unique experience. It was crowded but still enjoyable. I signed up for the Shamrock Shuffle a few months ago. Sometimes I sign up for a race and then regret it. However, I found myself anxiously anticipating this half marathon. I’ve been training hard since December in some nasty (i.e. cold, snowy, icy, and dark) conditions. I haven’t had a chance to test myself since the 10k Turkey Trot I ran in November. The Shamrock Shuffle took place on March 11, 2017. It was a great time to test my training and just over 5 weeks before my next marathon (the Boston Marathon! ), so it would provide some pacing guidance and a good training stimulus. Additionally, it was an opportunity for me to PR. That’s right, a sideways “H” course with four out-and-backs three times each. Plus there were some sharp turns onto and off of a walking bridge. It actually added up to 14 out-and-backs since we went back to the start area two times before finishing the third time. I was at least happy we were still going to be able to run. Like I said, it was a mini-taper. I’ve been doing lots of miles, so by Saturday morning I felt quite recovered. The weather was also great on race day. It was mid-high 40’s at the 10am start time with a breeze. It was warm enough that I was able to wear my tank top without gloves or a hat! I haven’t done that in months (especially since I usually run in the early morning). 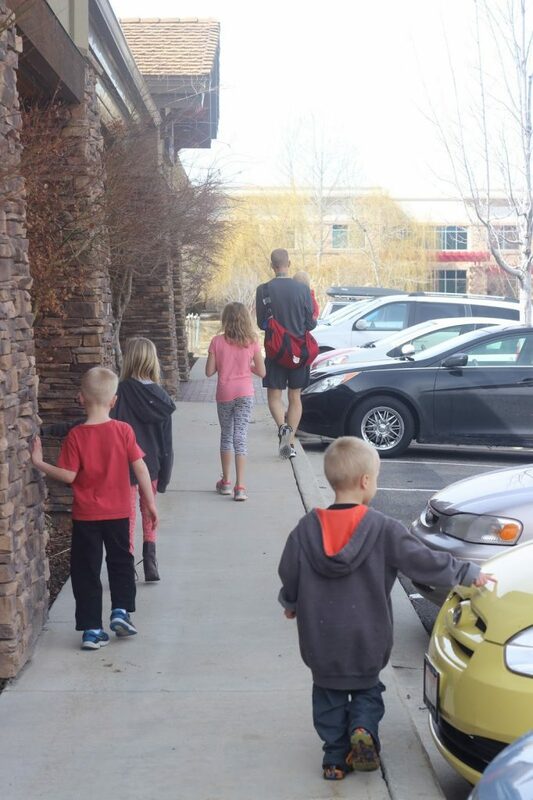 Once we started I immediately took the lead. I went a little too fast as usual, but I tried to pare it back within the first half mile. My target time was to break 1:20:00, which would take a 6:06 pace. I hit the first mile at 5:52, which really wasn’t too much faster than my target. I was feeling good, so I kept the pace just under 6 minutes/mile. It’s amazing to me how different a race feels than regular training. It’s hard for me to run a mile sub-6:00 when I train in the early mornings, but put me in a race and all the sudden it really doesn’t feel too bad. The first time I crossed the bridge in the center of the course I almost ran off the trail and down an embankment. The bridge has some grade to it, and I didn’t quite anticipate the sharpness of the turn. Luckily I caught myself. 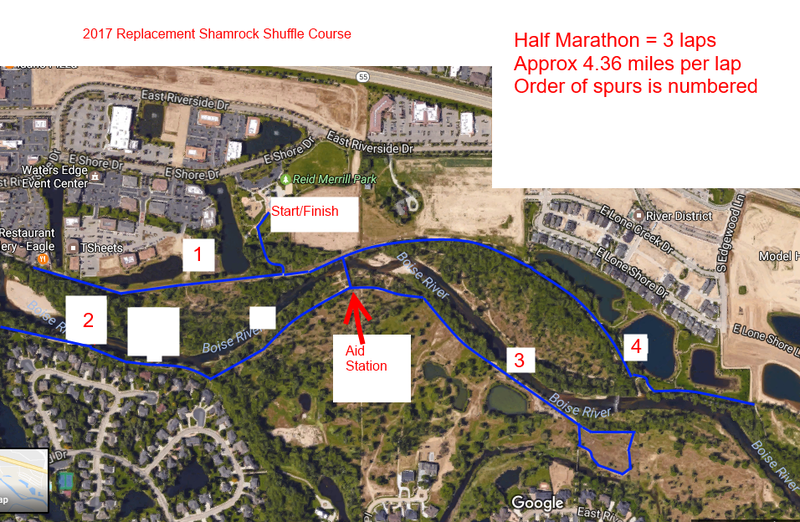 The nice thing about the out-and-back course was that I could see exactly where each of the other runners were. By the second turn-around I had a comfortable lead and it was growing. I hit the second mile at 5:55. Then the third at 5:56. The third turn-around was actually a little loop, which was nicer than a 180 degree turn like the other three points. I still felt good for the 4th mile and I was happy to be holding the sub-6:00 pace. I finished the mile at 5:55. However, at the turn-around at about Mile 3.5, I saw a couple fast guys coming up behind me. It freaked me out. Where did these guys come from? Then I realized they were probably 5k or 10k runners who were released a few minutes after the Half Marathoners but were only doing 3 out-and-backs instead of all 4. They passed me, but I was ok with that. After each “lap” we ran past the finish line and looped around to start over. I was pumped when I finished the first lap and crossed about 4.3 miles into the race. I completed the 5th mile at 5:54. Then the race started to get more interesting. The 5k and 10k runners and walkers were now on the course. The course was comprised of a walking path which was wider than a sidewalk but more narrow that a typical car lane. Some of the walkers didn’t mind walking 3 or 4 side-by-side. This meant that the runners were forced to do a lot of weaving and yelling warnings. I tried to be as kind as possible. I usually yelled out “coming left” before passing on the left. Then I would wheeze out a “thanks” when I passed them. I hope I didn’t come across as a jerk. In any case, the course was really crowded and it was all I could do to keep from bumping into people. On the other hand, it was a good distraction. When a race is lonely and spread out it can be easy to beat yourself up. In this case I was too concerned about which direction to dodge that I didn’t have to think about my tiring legs as much. Still, my legs were beginning to tire. Between the weaving and the fatigue I slowed my pace to just over 6:00/mile. Miles 6, 7, and 8 were 6:04, 6:00, and 6:02. During mile 8 I actually came to a dead stop at one point when someone stepped in front of me in a congested area. I finished my second lap at Mile 8.6 or so. After that I had a break in the congestion for about a mile, which was nice. I was still over the 6 minute pace but I knew I was on track to hit my goal time. I finished mile 9 in 6:02. During mile 10 I saw my former boss, Rhett, and his daughter. It was nice to see a friendly face on the course. They were running the 10k I think. With two turn-arounds to go, at about mile 10.5, the congestion mostly cleared. I was fighting to hold onto the 6 minute pace, but miles 10, 11, and 12 were my slowest at 6:11, 6:09, and 6:12. Finally during the second half of mile 13 I found my kick. 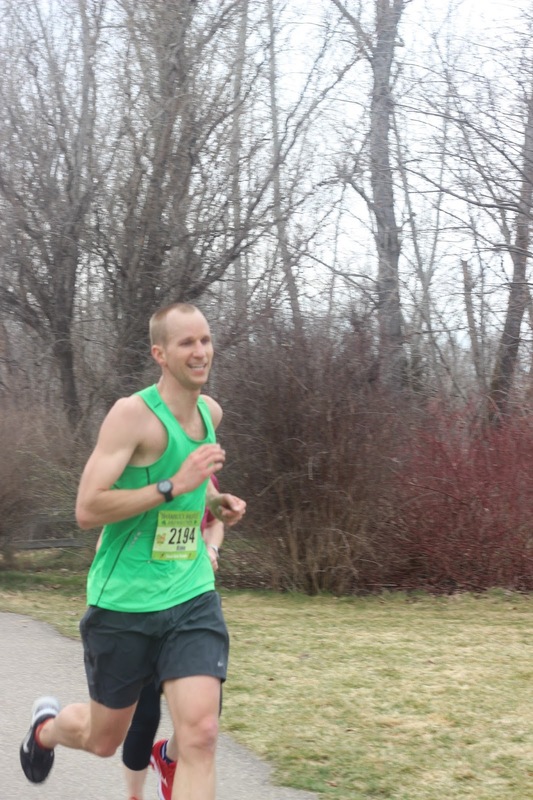 I visualized myself finishing and was able to speed up back to a sub-6:00 pace. I saw my family when I came around the last turn and I was able to give them a big smile. Unfortunately the course was short, or at least my watch said it was. I crossed the line at about 12.8 miles, but I wasn’t about to not get an official PR. So I just kept running through the park after crossing the finish. Hopefully I didn’t come across as a spaz, but I didn’t want to stop until my watch had passed 13.1. I kept running until about 13.12 and then went back to get my medal. I finished first overall — which was amazingly my fourth consecutive 1st place finish (Layton Marathon, Zeitgeist Half Marathon, Turkey Trot, and then this). Up until 2016, I don’t think I’d ever finished first place since maybe a race or two in high school. Due to the number of times everyone crossed the mat, there were errors with some of the times. That meant they couldn’t give out awards (they said they’d mail them out). This was fine with me because I didn’t want to stick around waiting. I did grab some snacks though. Delicious brownies with mint (green) chocolate chips, cookies, pretzels, apple slices, and orange slices. Plus they had hot chocolate. They gave out glasses — presumably for drinking beer, although they didn’t have any beer. That was fine with me since I don’t drink. It was a fun race and a good day with near perfect weather. I’m sure they’ll fix the course next year and it will be an even better experience.